Aiming at helping you make an informed decision, this guide will go over the best pontoon boat grill options you have this year. Taking into account factors such as usability, practicality, and overall quality, we selected five products that stand out. With thoroughness in mind, this guide will go over each product’s specifications in detail. Next, it will provide a general description of each grill. Finally, it will offer a useful list of pros and cons for each product that will help you decided whether it is right for you or not. Without a doubt, the best pontoon boat grill products are those that feature a sound balance between resource saving and efficiency. Being compact and energy-efficient, this pontoon boat grill is perfect for being used on deck without wasting space or resources. As if that wasn’t enough, the brand’s proprietary swiveling turbo venturi tube allows you to adjust the product with an astounding level of precision. Additionally, its compact design allows it to heat up very quickly, further helping conserve efficiency. At the same time, it will produce a fully-cooked meal in a matter of minutes. Made entirely of 18-9 mirror polished stainless steel, the Magma Marine Kettle Gas Grill is also durable and resistant to heat and other types of damage. This product is often referred to as the best pontoon boat grill on the market. Largely, this is due to its efficient, compact, and stable design. Using a thread-lock, a two-piece pedestal, and a simple and straightforward deck mount, this grill can be safely installed anywhere on your boat. After use, its surface can be easily cleaned while the grill can be packed very compactly in order to be stored. 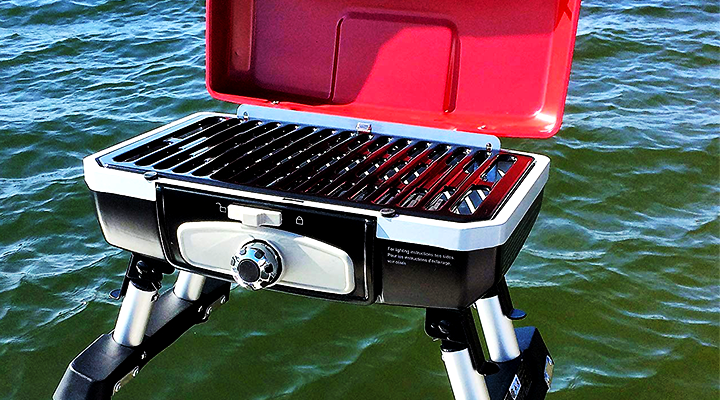 Whenever you want to use this grill on land, it can be used without the pole. In this form, the Springfield Deluxe Propane Grill acts like a regular tabletop grill. As anyone who has any type of sailing experience knows very well, sometimes the weather gets rough out there. Featuring a proprietary self-regulation technology named PerfectFlow, this grill provides a constant performance even under the most difficult conditions. In addition, the Coleman Camp Propane Grill features its own PerfectHeat heating system, a technology that results in added energy efficiency and cooking speed. Astoundingly, this grill has 180 square inches of cooking space. Durable, efficient, spacious, and very easy to clean, this product is, without a doubt, a worthy candidate for the title of best pontoon boat grill on the market. This model features an incredibly innovative design that allows mounting on the railing of your pontoon. As a result, the Extreme Marine Products Cuisinart Grill Modified for Pontoon Boat allows itself to be mounted on any 1.25-square inch pontoon boat railing. Its solid Zinc electro-plated steel Arnall’s brackets come pre-attached, making the entire installation process incredibly easy and straightforward. Once installed, this grill is capable of cooking large amounts of food simultaneously due to its 145 square inches of grilling surface. Despite its large size, however, this grill is very stable and safe, even providing a special mount for the propane tank. Providing great cooking power and maneuverability at the same time, this product could very well be the best pontoon boat grill this year. The last product on our list of the best pontoon boat grill options on the market is the Kuuma Stow and Go 160. Such a state-of-the-art grill is made of 100% stainless steel, guaranteeing durability and superior performance. Apart from being incredibly sleek-looking, its minimalistic design allows for efficient, energy-conserving cooking as well as easy cleaning. Using a single arm bracket, it can be mounted on any pontoon boat railing with incredible ease. Very portable, efficient, and easy to use, this is a product that is definitely worth checking out. Without a doubt, the five products featured on this list deserve consideration due to their high level of quality and overall efficiency. Depending on your particular needs, you may favor one of them above the others. Is there a particular product that caught your eye? Let us know in the comment section! I’m looking for a pontoon boat grill for a family friend who recently inherited a pontoon boat. This looks like a good one! Plenty of grilling service to cook for family and friends at once. It’s compact too though. Hey, Lola-Rose, great to have you with us! Don’t forget to tell us which pontoon boat grill model you selected with your friend!